Danish urban planner extraordinaire, Jan Gehl, was at the Design Exchange on Wednesday, talking about public spaces for the 21st century. Gehl is the powerhouse behind Melbourne's successful urban design strategy and he recently worked with New York City's radical Commissioner of Transportation Janette Sadik-Khan for the PlaNYC Initiative, including the new pedestrianization of Times Square. If you want clearly-stated, clearly-do-able urban design, Gehl is the man to listen to. And the city of Toronto is listening. The old Toronto Stock Exchange was standing-room-only for Gehl's lecture. "I am a bit surprised that at 3 o'clock on an ordinary Wednesday, we can have half of Toronto at the Design Exchange," Gehl marvelled, getting to the podium. Founder of Gehl Architects, and a retired Urban Design professor at Copenhagen's School of Architecture (at the Royal Danish Academy of Fine Arts), Gehl is an incredibly charming, articulate, and exuberant proponent of the walkable city. Starting out with praise for Jane Jacobs, Gehl has his audience wrapped around his practical fingers within seconds. He credits his vision of the livable city to his wife - he claims that when he married, years ago, his psychiatrist wife demanded, "Why are architects not interested in people?" So Gehl became interested in people. "Being sweet to people is really sweet to the economy," he says. (Hear that, Toronto City Council?) But how to be "sweet" to a city's inhabitants? According to Gehl, a sweet city is lively, attractive, safe, sustainable, and healthy. And we already know how to do this: limit cars, encourage bicycling, and create better outdoor public spaces so that people can walk on the streets of our city. Gehl believes firmly in the built-a-better-mousetrap theory: if we make a city's core amazing, people will want to live there, and the city will thrive - economically, culturally, and architecturally. "Make the space good and they will come. I have not a single example of anywhere in the world where this is not true. When we provide places of good quality, people will come. Because there is nothing more interesting in the city than the people." And he's not talking out of his hat: Gehl has been involved not only in making Copenhagen the amazingly walkable city that it is today, he's also been changing cities across Europe, Australia, New Zealand, South Africa, Mexico, the U.S., China, and Saudi Arabia. So how can we apply these ideas to Toronto? Unfortunately, in a city hampered by the ward system, where City Council seems unable to get out from its car wars, I just don't know how Toronto is going to put this into action. Our mega-city means suburban councillors all-too-often dictate downtown decisions. Gehl stays away from directly criticizing our City plans. Instead, he focuses on success in other countries; his work in Melbourne seems particularly relevant to Toronto - our cities have similar built histories, sprawl problems, and public issues. But after a radical shift in outlook in 1994, Melbourne now has the most extensive tram system in the world and has "Copenhagen-ized" its downtown, making it pedestrian and bike friendly. It's also considered one of the best places to live on the planet. "It's a matter of invitation," Gehl says. "Ever since the car rolled in, it is as if we've forgotten why it is we had cities... It is arbitrary, the level of traffic in each city. It is silly to add more roads, you'll only get more traffic." But the same equation means a city that gives more lanes to bikes and pedestrians will increase bikes and pedestrians. And increase quality of life. That's exactly the route New York has decided to go, with Gehl's help. "And New York, if you can do it there, you can do it anywhere," he half-sings. But getting our city to budget for a big idea seems like a long pedal uphill. In a city where the tiny change of a bike lane on Jarvis causes City Council to erupt with charges of car hatred, I wonder how we're ever going to get to a 21st century approach to solving our problems. I wish Gehl could wave his practical Danish hand and get us a miracle. 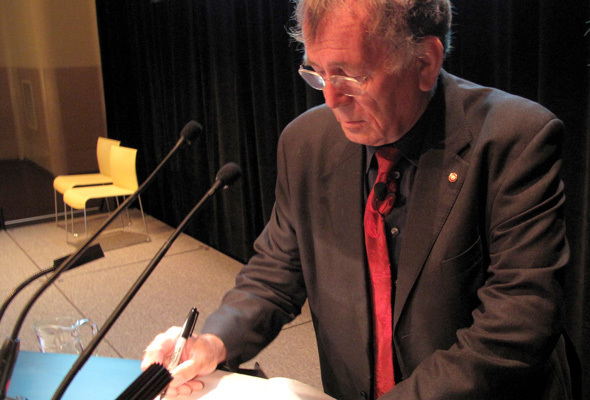 Jan Gehl's presentation has been archived on video and is now available for viewing on the Design Exchange web site. Biking Broadway photo courtesy of Gehl Architects. 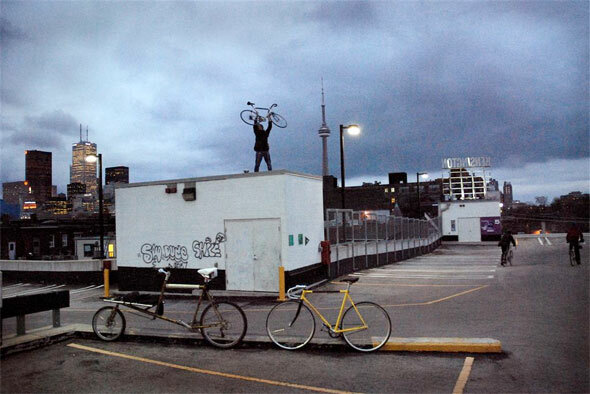 Photo of cyclists in Toronto by Leanne Eisen.